Justin Schwartz raises to 26,000 from the button and Bernard Lee calls from the small blind. Sal Attina then moves all-in from the big blind for just a few chips more. Schwartz then announces that he is all-in and Lee folds A-10 face up. The board runs out [Jc][3h][3d][2d][9c] and Schwartz flops trip three's to win the pot and eliminate Attina in 6th place for $12,431. 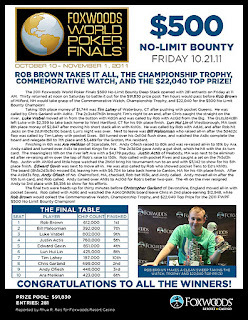 Justin Schwartz raises to 22,000 from under the gun and Stephen Hemsworth calls from the big blind. The flop comes [7h][6c][4h] and Hemsworth checks. The turn is the [9h] and the river comes the [Jh]. Schwartz's aces wins the pot and eliminate Hemsworth in 7th place for $10,280. The board comes [Qs][3c][2s][Qh][3h] and Schwartz's kings hold up to eliminate Campo in 8th place for $8,606. The board runs out [9c][6h][2d][Qc][Jc] and Raskin pairs his queen to win the pot and eliminate Matros in 9th place for $7,533. 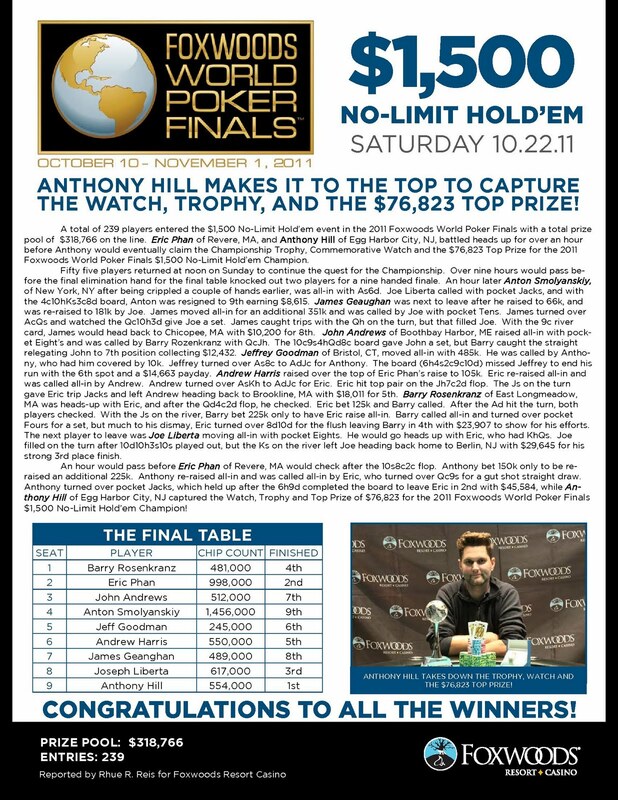 The nine players remaining in the $2,500 No-Limit Hold 'em event have returned from dinner break and cards are back in the air. 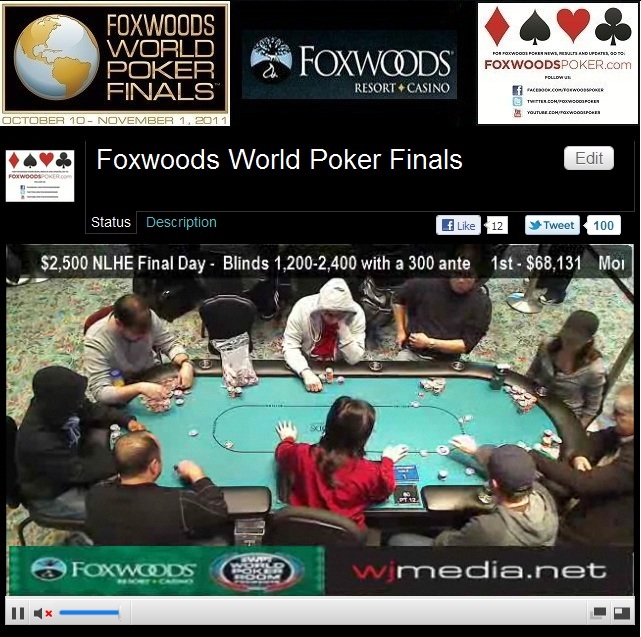 You can watch the live stream by clicking "Watch LIVE Feature Table" at the top of the page. The nine remaining players in the $2,500 No-Limit Hold 'em event are now on dinner break until 9pm ET. The board runs out [Qs][Td][8s][2h][Ah] and McNeil wins the pot to eliminate Kellstrom in 10th place for $6,215. We have reached the final table of the $2,500 No-Limit Hold 'em event at the Foxwoods World Poker Finals. 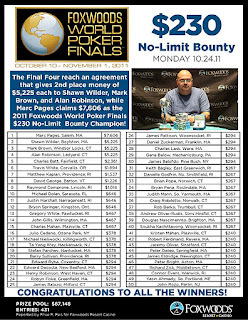 With 16 players remaining and top 15 spots cashing, the bubble bursts in the $2,500 No-Limit Hold 'em event at the 2011 Foxwoods World Poker Finals. Miami John Cernuto is the first causality on Day 2 of the $2,500 No-Limit Hold 'em event. His pocket sixes failed to improve after getting all-in before the flop against Mike Kalfa's pocket tens. There are now 17 players remaining with the top 15 spots finishing in the money. Day 2 of the $2,500 NLHE Now Streaming Live! 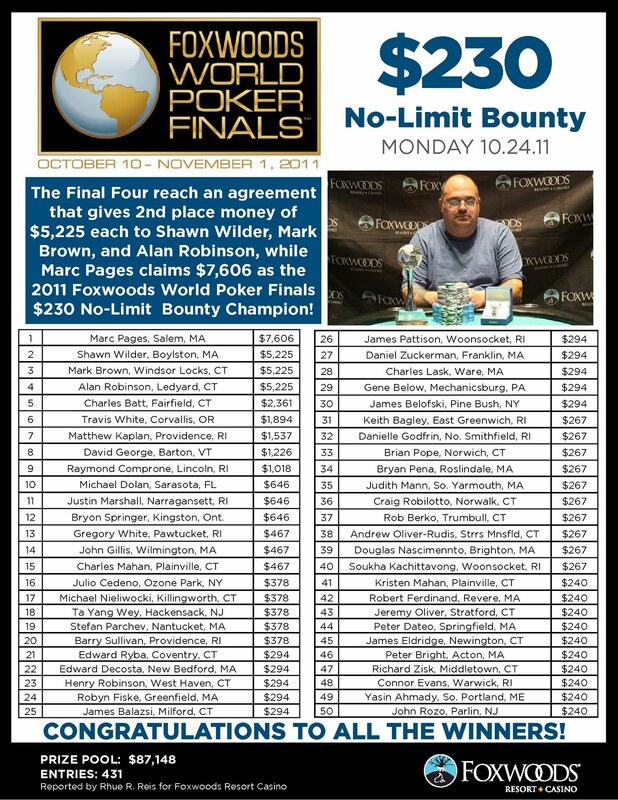 The final day of the $2,500 No-Limit Hold 'em event is now streaming live. Just click "Watch LIVE Video" at the top of the page to view the live stream. There are 18 players remaining and the blinds are 1,200-2,400 with a 300 ante. 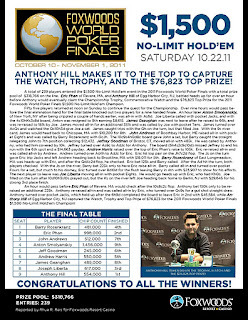 Day 2 of the $2,500 No-Limit Hold 'em event kicks off at 2pm ET today. You will be able to watch the live stream of all the action by clicking "Watch LIVE Video" at the top of the page.